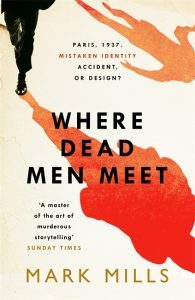 Where Dead Men Meet is a grand adventure, in the tradition of Graham Greene’s ‘entertainments,’ and John Buchan’s before that – a sweeping race through Europe for the highest possible stakes, in the year before the Anschluss. Here’s hoping it’s only the first of many exploits for Luke and Pippi. The best novel I read this year. Where Dead Men Meet is an exhilarating and hair-raising charge through pre-War Europe, with danger at every stunningly beautiful turn. Mills’s descriptions of Paris, Venice, and Zurich are filled with both elegance and lurking menace. Mark Mills is Alan Furst with after-burners, and this book is a powerful tale of revenge, love, and self-discovery, all packed into an utterly compelling historical thriller. 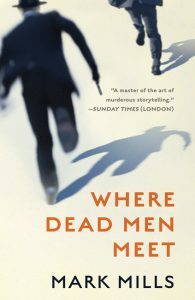 Where Dead Men Meet marks something of a departure for me as a writer. Like most of my previous novels it is a period mystery, but it stands apart from my other books in one key respect. Whereas they have been set within tight, clearly-defined worlds – a fishing village on Long Island, an Italian villa, an island under siege – Where Dead Men Meet is an out-and-out chase thriller that takes the whole of Europe for its backdrop, as Luke finds himself hunted from Paris to Venice by way of Germany and Switzerland. It was great fun writing something more expansive, more relentless and more action-packed while still trying to keep a grip on a tight mystery. The narrative of an innocent man on the run from shady assassins whose motives remain unclear has a long and rich tradition in literature and cinema (who can forget Hitchcock’s North by Northwest?). In some ways Where Dead Men Meet is my paean to a number of novels I read and adored when younger: Eric Ambler’s A Coffin for Dimitrios, John Buchan’s The Thirty-Nine Steps, and Rogue Male by Geoffrey Household. This last is a strangely neglected book: the gripping tale of an unnamed Englishman’s efforts to evade capture and return home following his failed assassination of an unnamed European dictator. The urge for home also figures large in Where Dead Men Meet, as the action draws Luke inexorably back to his roots and the answer to the question that has haunted him all his life: ‘Who am I?’ For twenty-five years he has been defined by his abandonment as an infant on the steps of a Catholic orphanage, and the knowledge he is about to acquire will re-define him. In this sense, his really is a ‘journey of self-discovery’, to use that tired old phrase. I’m not sure any of the books mentioned above (and many more besides) would exist had Homer never penned The Odyssey – my desert-island read. If you haven’t read it, please do. It’s surprisingly humorous, despite the many horrors and tribulations that Odysseus is forced to confront during his ten-year journey back to Ithaca after the Trojan War. Once home, however, he finds his problems are far from over; he still has to deal with the suitors who have been besieging his wife Penelope during his long absence. This idea directly informed the denouement of Where Dead Men Meet. I was determined to blunt Luke’s happy homecoming. There is no tearful reunion with his long-lost parents; there is hidden evil at work within the family waiting for him in Venice, and ultimately he is unable to take up his rightful place in the family because of the dark deeds he has been obliged to commit during his travels. That makes the ending sound downbeat, which I hope it isn’t. Luke is indeed restored, in his own eyes, which is what matters most.